"The cake traditionally celebrating Epiphany in France and Quebec is sold in most bakeries during the month of January. 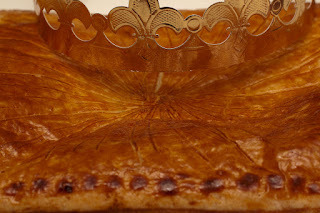 Three versions exist: in northern France, Quebec, and Belgium the cake called galette des rois (which can be either circular or rectangular) consists of flaky puff pastry layers with a dense center of frangipane or apple. In the west of France a sablé galette is made, a form of sweetcrust pastry. In southern France—Occitania, Roussillon, Provence, Catalan where it is calledtortell—the cake called gâteau des rois or royaume, is a torus-shaped brioche with candied fruits and sugar, similar in its shape and colours to a crown. This later version is also common to Spain and very similar to New-Orleans king cake. Tradition holds that the cake is “to draw the kings” to the Epiphany. A figurine, la fève, which can represent anything from a car to a cartoon character, is hidden in the cake and the person who finds the trinket in his or her slice becomes king for the day and will have to offer the next cake. Originally, la fève was literally a broad bean (fève), but it was replaced in 1870 by a variety of figurines out of porcelain or—more recently—plastic. These figurines have become popular collectibles and can often be bought separately. Individual bakeries may offer a specialized line of fèves depicting diverse themes from great works of art to classic movie stars and popular cartoon characters. The cakes are usually sold in special bags, some of which can be used to heat the cake in a microwave without ruining the crispness of the cake. 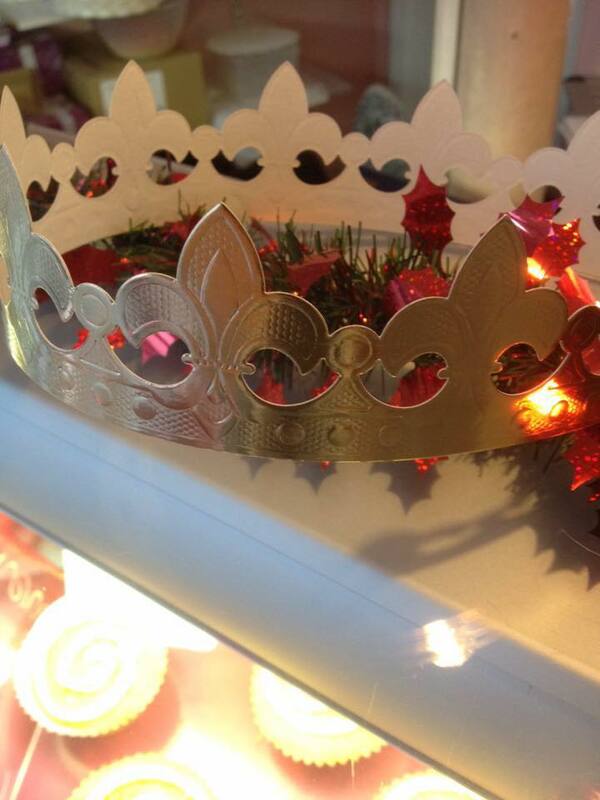 A paper crown is included with the cake to crown the "king" who finds the fève in their piece of cake. To ensure a random distribution of the cake shares, it is traditional for the youngest person to place him- or herself under the table and name the recipient of the share which is indicated by the person in charge of the service. Formerly, the cake was divided into as many shares as there were guests, plus one. The latter, called "the share of God," "share of the Virgin Mary," or "share of the poor" was intended for the first poor person to arrive at the home." We are making some fresh ones every day, but when they're gone, they're gone! !